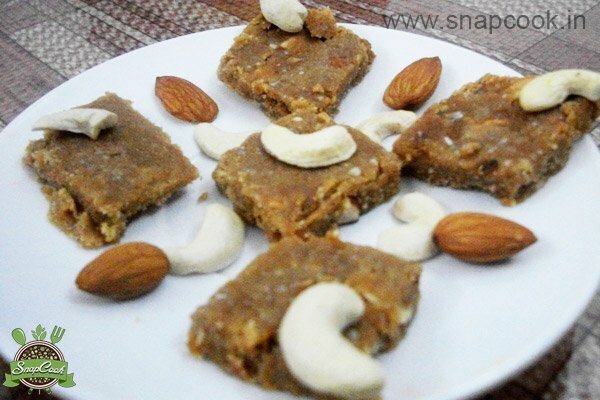 Sukhdi is a Gujarati dessert which can be made easily from commonly found ingredients at home. I tried it in Ahmedabad and now it is all time favorite of my all family members as it is easy and quick to make. Keep a small tray/plate or a deep dish ready, greasing the bottom with a non-stick spray or ghee. Take kadai on middle flame and roast wheat flour, stirring continuously for 5 minutes. Add dry fruits also and continue to roast with flour. Add ghee and stirring continuously for another 1 minute . Add jaggery to it and turn off the gas immediately. When the jaggery is melted pour the hot wheat batter on the greased plate and spread the batter evenly on it. Let the mixture cool down, with the help of knife cut sukhdi into any desired shape. Decorate it with the cashewnuts. Your tasty sukhdi is ready and you can store it in a container for few weeks. You can sprinkle khus khus (poppy seeds), roasted til or coconut powder also. You can also add chocolate powder for your kids. You can also add grinded dry fruits for different taste.